I define integrity as the alignment of my thoughts, words and actions. What happens when accountability and integrity clash? Let me answer this with a story. In October, 2004 I staffed a Mankind Project New Warrior Training Adventure (NWTA) weekend on Vancouver Island in British Columbia. Each NWTA is required to have a “Certified Leader” and at least two “Certified Co-Leaders”. The leadership certification process is very rigorous and one does not get certified without considerable training and peer evaluation. The leader of this particular weekend was flying from Texas. When his plane landed in Atlanta, he got word that his wife was sick, but without any specific details. He boarded the plane from Atlanta to Vancouver, BC and learned that his wife had been taken to the emergency room and was in surgery. He was faced with a very difficult choice: to be in accountability with his commitments as an NWTA leader, he must continue to Vancouver Island and show up at the training site; however to be in integrity with his relationship with his wife, he had to return to be with her through her current ordeal. Which choice did he make and why? 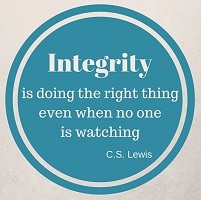 Which is more important, accountability or integrity? If keeping an agreement with you requires that I compromise my own integrity, then keeping that agreement diminishes me. If I want to remain in right relationship with you, I have to trust that you will understand that right relationship with you requires right relationship with myself. I am still responsible for dealing with the impact of breaking an agreement with you, but my higher responsibility is to my own sense of integrity. Our weekend leader made the same choice. He contacted us and told us the situation. We needed to get permission for one of the co-leaders to act as a full leader for this weekend or we needed to cancel the weekend. The two co-leaders then contacted the NWTA leadership council and told them the situation and received a special dispensation for this weekend only for one of them to act as the full leader. This incident resulted in considerable navel gazing by the MKP Leadership and by the staff members like me. What I learned was the importance of the old cliche, “To thine own self be true.” And I learned the importance of taking responsibility for dealing with the impact of my choices on others and on myself.